Asus today announced the ZenWatch 3, its third-generation Android Wear-based smartwatch. The ZenWatch 3 is the first round wearable from Asus and features a rose gold accent surrounding the watch face. The smartwatch is made from stainless steel and comes in gunmetal, silver, and rose gold. The chassis measures 9.95mm thick and Asus says it is strong enough to withstand the rigors of daily use. The watch will be sold with leather or plastic bands. There are three buttons around the exterior edge for controlling the watch, one of which can be customized to launch user-defined actions. Asus says the ZenWatch 3 will have more than 50 watch faces preloaded, many of which support complications, such as the weather, step counts, or notifications. A separate app will allow owners to design their own watch faces. A new health-focused app is better at counting steps and can remind people to move after long periods of inactivity. Last, Asus claims the ZenWatch 3 offers two days of battery life and can take advantage of rapid charging to reach a 60% charge in just 15 minutes. More details are yet to be announced. Samsung today announced the Galaxy Watch. It includes the company’s signature circular, rotating bezel. 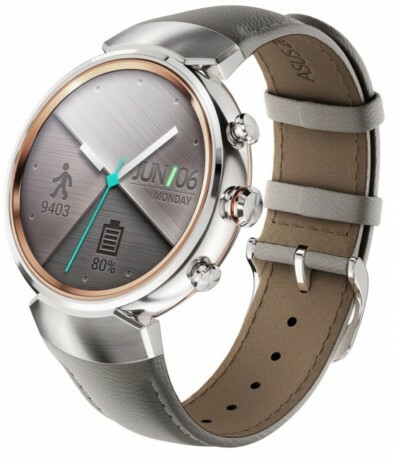 Huawei today announced the Watch GT, a smartwatch that has a traditional appearance and focuses on fitness. Huawei says the Watch GT is designed for "urban explorers" and can track a wide range of activities.